In Case You Missed It… An Overview of our January Networking Luncheon! 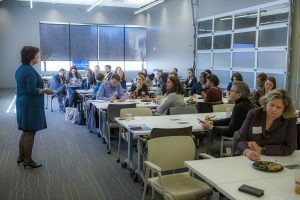 IABC Atlanta launched its 2018 monthly luncheon series with a seasonally-appropriate discussion on work-life balance and optimization. Corporate leadership speaker, coach and author Tricia Molloy facilitated an inspirational exercise in identifying our motivations, values and natural gifts to help us prioritize the pursuit of our professional and personal goals. The second half of the session focused on strategies for success in pursuing change in the areas we prioritized. Purpose is the foundation of everything we do and the decisions we make. “Each decision brings you closer or further away from your purpose,” said Molloy. Other important strategies include managing our energy and creating the space by clearing out clutter. Citing her 2006 (updated 2012) book Working with Wisdom: 10 Universal Principles for Enlightened Entrepreneurs, she recommended the use of positive affirmations, along with mindfulness and authenticity. 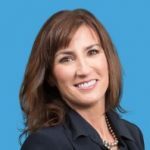 Tricia Molloy is a corporate leadership speaker on work-life balance and achieving goals. She presents keynote talks and vision board workshops at conferences and for organizations like Marriott, the CDC and Kellogg. She also owns Molloy Communications, a public relations firm. 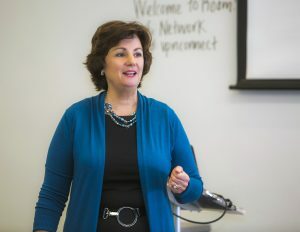 For more information on her speaking and coaching programs, visit triciamolloy.com. You can also connect with her on LinkedIn, Facebook and Twitter. Communication planning season is upon us! Throw the confetti and bring out the glasses of wine. Communication teams are brainstorming, planning, and putting the finishing touches on their 2018 plans, or so I hope. Effective communication is the result of intentional planning and identification of specific tactics that will achieve organizational goals. While most communication plans are created with external audiences in mind, it is imperative that internal audiences remain at the forefront of all communication planning. An organization’s success begins with its ability to engage and inform its employees. They are the gatekeepers to an organization’s overall performance and profitability, so it is vital that they understand how their daily tasks align and contribute to the organization’s goals and strategies. If you have completed your 2018 internal communication plans, hats off to you. If you have not, do not fear. Here are seven tips to consider when creating your internal communication plan. 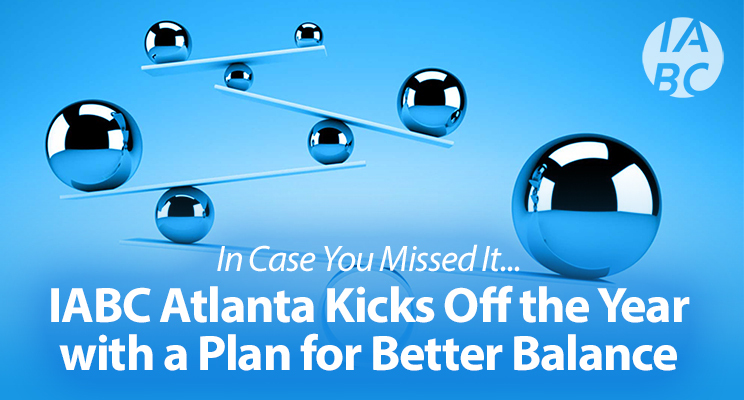 Create a poll or survey to identify improvement areas for your current plan. If you have time, create a survey that focuses on specific areas you suspect need improvement. Use open-ended questions to solicit feedback. If you are short on time or work in an environment in which the employees are pressed for time, consider using a poll. Select one or two questions that you think would really help with updating the communication plan. For example, ask employees if they are satisfied with the current communication vehicles used to distribute information. Do they feel the information distributed is useful? What would they change about the current internal communications? These questions are quick and to the point. Employees are more likely to participate and provide feedback. Employees are a valuable resource to use when attempting to gauge the organization’s culture and climate. Interview a few to get their opinion of what the company is doing well in regards to employee engagement, as well as what the company could improve on. Use their responses to come up with topics or themes for the company newsletter, blog post, event planning, or even providing feedback to senior managers and executives. You have conducted surveys, polls, and interviews, now make sure you take those responses and really listen to the needs, desires, and feelings of your internal audience. They trusted you enough to share their thoughts and opinions, use that information to make a better strategy to communicate and engage them in 2018. Effective listening is one of the most crucial skills to have. It is also one of the hardest to apply. We all have a lot going on and it is easy to “zone-out” when you should be listening. It takes a conscious effort to remain in the present and not drift away. But you must do it. If you are serious about improving your organization’s internal communications, listen to the needs of your internal audience and try to address those needs in the upcoming year. You will not be able to address them all, but pick a few and be intentional about bringing those issues to the forefront throughout the year. The employees will be appreciative and more likely to participate in future surveys, interview, and polls. There is nothing more frustrating as an employee than taking the time to respond to a survey or poll only to find out your concerns have fallen on deaf ears. If for some reason you are unable to address a concern, be transparent and give a reason why it may not be addressed in the upcoming year. Transparency and honesty go a long way in gaining the trust and respect of the employees. This is a difficult task, no doubt, but very necessary. Technology continues to change how we communicate with one another and it shows no signs of slowing down. As a communicator, you must stay informed of these changes because they could affect your communication goals or the decisions you make about distributing information. You can stay abreast with the help of social media, your IT personnel, articles, and professional associations. Being informed about upcoming technologies can help with planning your communication needs in the future. Does your company need to upgrade? Can the system be used by all departments? Is it a system used by communicators only? Will it enhance your current system and increase productivity? These are all questions that need to be asked when deciding if the latest technology will be beneficial in communicating with internal stakeholders. Different communication channels are needed depending on the complexity of the message being delivered. Many times, you need to use multiple channels to ensure the message is received efficiently and in a format, that provides clarity. Decide if the message is complicated or will elicit strong feelings. If so, a face-to-face meeting or broadcast media may be appropriate. Allowing the audience to interact with the speaker can absolve doubt and fear. The audience also has the opportunity to ask questions and interact with the speaker. Mobile channels can be used to deliver private, complex messages to individuals or small groups. The audience is able to interpret the speaker’s tone and message. Mobile channels can save on time and difficulty it may take to coordinate a face-to-face meeting. If the message is less personal, consider using email, websites, intranet, or social media. However, make sure the message is clear and to the point. Messages that need little to no interaction can be delivered in the written form: policies, letters, announcement, etc. Use a combination of these channels to make sure the message is being delivered in the most efficient manner. Consult with senior management and executives to determine a policy for sharing information. Lack of information in a timely manner leads to rumors and anxiety. Employees feel distrust and detachment from the organization when they are kept in the dark. Of course, you cannot share everything, but senior leadership should make every effort to share information about what is going on in the organization and how it will affect its employees. If change is coming down the pipeline, address the changes to expect. Frequently sharing information on a consistent basis will help strengthen the employee’s commitment to the organization. Remember they are adults and would rather hear bad news than no news. Last, but certainly not least, identify the metrics you will use to define success. Decide if your definition of a successful internal communications campaign is defined by social shares, employee engagement metrics, or the number of employees logging onto the intranet. Will you use surveys and polls throughout the year? If so, at what intervals? What are you looking for in your analysis of the data collected? Are you measuring likes, comments, and shares on an article? Did a topic really get employees talking? Was the company picnic and holiday party a success because of information gathered from employees? Whatever you decide to use should measure results that move the organization towards its goals for 2018. Communications planning can be overwhelming and stressful, but the tips above should help you in identifying factors you should consider when developing your plan. I hope 2018 is your best year of communicating internally! Crisis Communications: Are You Prepared? The expansion of the internet has made it easier than ever for consumers to engage with brands. Consumer engagement can come in the form of praises over a new product, service, or outstanding customer service. It can also be negative in nature — the wrong product or a bad customer experience. The latter usually receives the most attention. Social media is usually the preferred choice of engagement and companies should be prepared to respond to engagement that could do damage to their brand’s reputation. A timely response is essential. Long gone are the days brands are able to ignore negative comments and conduct business as usual. Consumers are paying close attention to how brands respond to negative chatter, particularly if that chatter relates to political, racial, or social issues. The audience your brand serves doesn’t matter, your targeted audience expects you to respond in a manner consistent with your brand’s values. The Institute for Public Relations defines a crisis as an event that poses significant threat to operations and can have negative consequences if not handled properly. Is your company prepared to respond to a crisis? Do you have a crisis communication plan and team established? If not, now is the time to assemble a crisis communication plan for your company. The question is not, if a crisis will occur … but when it will occur. A timely response is paramount. The longer it takes your brand to respond to a crisis event, the more damage your brand’s reputation endures. Creating a crisis communication plan is not difficult, but it requires strategic planning and thought. To help you better manage the creation of the plan, let’s separate it into three phases: pre-crisis, mid-crisis, and post-crisis. Each phase provides a few strategies to help you create and implement a crisis communication plan specific to your company’s mission and needs. Identify Team Members: Meet with senior executives and identify members to serve on your company’s Crisis Communication Team (CCT). This team should consist of the company’s CEO and representatives from: public relations (PR), legal, and major divisions within the organization. This team should also include subject matter experts in the event that the response requires technical language. A crisis manager should also be identified, someone who will lead and organize events related to response from start to finish.Your legal representative should understand that “no comment” is not an acceptable answer during a crisis. It conveys guilt and suspicion to the public. They should work closely with the PR representative to approve language that adequately addresses the situation without compromising possible legal issues. Create Crises Scenarios: Plan brainstorming sessions with your CCT. Think of all the potential crises that could threat your brand’s reputation. Consider all the issues in society that could cause your consumer to engage with your brand outside of the products and services you provide to the market. These issues could be political, racial, societal, environmental, etc.Look at the current issues circulating and study how other brands have responded. Create a response to those issues based on your brands values and mission. Think of how the crisis event could affect other areas of your company and prepare a plan to mitigate damage to areas such as operations and personnel.An assessment checklist can serve as a framework for an efficient and effective response. Identify & Train Authorized Spokespersons: One or more persons should be identified and authorized to speak on the company’s behalf. This person should ideally be the CEO or a senior level executive. They should be pre-screened and trained to convey a clear and consistent message using multiple channels of communications.Identifying a spokesperson while in the line of fire could be a poor and costly decision.Ensure the spokespersons are professionally trained to speak to the media. You want to avoid your organization’s message being misconstrued or misinterpreted. Proper training will prepare your spokesperson to optimally deliver the message to all stakeholders. Define Your Stakeholders: It is important to define those affected by the crises. It will help you craft a message that resonates with them and their concerns about the event. Your stakeholders are internal and external, don’t forget to address your internal stakeholder. They may have questions and concerns about how the event affects them on a professional level. Develop Talking Points: It will take time to develop a strategic response applicable to the crisis event. Talking points can be prepared in advance based on the scenarios developed during the pre-crisis phase.Your organization will save time and be able to respond quickly while a more in-depth message is developed. Remember time is a critical factor when responding to a crisis.Review your talking points often and determine if they require revision and/or creation of additional talking points for different scenarios. Prepare a Transparent and Thoughtful Response: Consumers are not expecting you to be perfect, however, they are expecting you to address their concerns and/or negative comments about your organization. Don’t ignore or cover up the issue, it makes the organization look like they don’t care about the customers.If you are not informed about the issue, be honest and ask for time to look into the issue and become informed. If you made a mistake, apologize, and outline a corrective action plan.Put thought and effort into your response. It shows that you care about the consumers’ concerns and you’re willing to go above and beyond to address the problem.A carefully constructed and thoughtful response builds trust and allows you to foster a nurturing relationship with your customers. Your customers will appreciate it and become champions for your brand.Word-of-mouth referrals are more powerful than your own brand messaging. Finalize Crisis-Specific Messaging: After disseminating your talking points, finalize messaging specific to crises for any given situation. By now, your team knows what type of information stakeholders require and what messaging your company wants to convey to the public. Be brief and simple, identify a few main messages for all stakeholders and more targeted messaging for individual groups of stakeholders.Don’t forget to plan for your social media platforms. Conduct an After-Crisis Analysis: What went wrong? What went right? What did we learn? How can we improve?Those are all questions that need to be asked and analyzed. Decide who will be a part of the after-crisis analysis and who will work on the items identified for improvement. Crisis Communication planning is an on-going process of analyzing and improving. Today’s consumer is progressively aware of the issues affecting the many areas of our lives. It is imperative that your organization identify issues that may possibly threaten your brand’s reputation. The steps outlined above will help you begin to create a framework to mitigate any threats your brand could sustain to its reputation during a crisis. 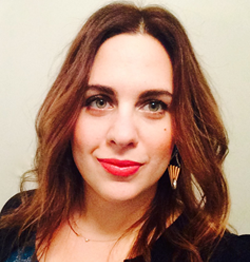 An interview with Elizabeth Baskin, Founder of Tribe, an internal communications consultancy in advance of her presentation to IABC Atlanta’s monthly luncheon chapter. Silos occur in every organization, from the small start-up to large, global corporations. “You read a lot about vertical silos in companies, meaning the disconnect between employees in different departments, business units or geographic locations,” explained Elizabeth Baskin, CEO and executive creative director for Tribe, Inc., an internal communications and branding agency focused entirely on developing internal brands. According to Baskin, these silos are very common in companies with a large number of non-desk employees, and “manufacturing and retail, have a harder time with this because it’s more difficult to create communication channels between corporate and those employees without dedicated computers,” she said. However, it can be just as big of a divide within companies with “deskbound” employees, too. “The culture of the company also is a factor, as well as the communication style of the leadership,” Baskin added. 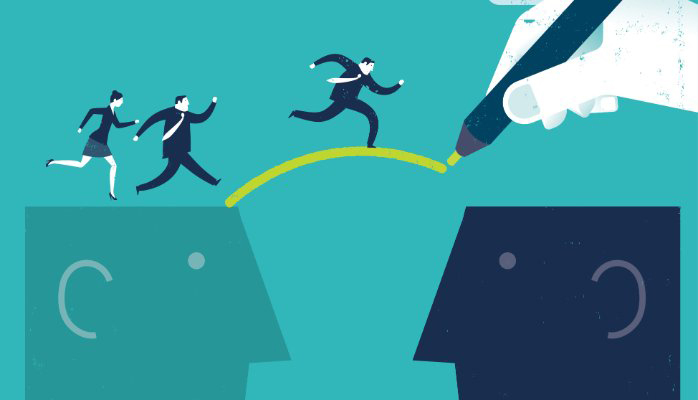 And if bridging the gap between the C-suite and the rest of the company were an easy task, communications professionals would not be having this conversation. “You have to be creative in thinking of communication channels for this group,” she said. Elizabeth Baskin founded Tribe in 2002, an internal communications agency focused in developing strategic plans to build employee engagement and the internal brand. She founded Tribe in 2002 as a branding boutique and quickly grew the business to a $5 million company. In 2009, she launched Starter Cards LLC, a division of Tribe, to create content such as the Start Your Own Company iPhone application and the Social Media for Old Folks webinars. An interview with IABC Atlanta speakers, Jessie Ford and Christina Edwards, of Birds of a Feather Creative, to hear their thoughts on what makes a great social media strategy. Q: Have you found any differences among types of companies or industries in people’s understanding of social media for business purposes? If so, what do you attribute the discrepancies to? Every industry and business can benefit from social media marketing. There isn’t one type of industry that we have come across that seems to be more averse to understanding the benefit of social media. However, some industries, primarily in the B2B space, are more hesitant when it comes to any sort of change. Opening up your business to social media can really change the entire dynamic of your marketing strategy. Q: Have you seen the concept of ROI for social media really catch on yet? How do you measure ROI for something like social media and PR?? Absolutely. Measuring the ROI of your social networks is completely necessary to ensure that your audience is engaging with the content that you’re creating. There are many sophisticated listening tools that social media industry pros use to audit ROI. However, most businesses can use the tools that the social networks inherently provide such as reach, views, and engagement. Q: What advice do you have to B2B marketers who have to convince their more conservative colleagues to embrace social media for the B2B arena? We believe that businesses should utilize their social platforms like they do magazines or newspapers. If you aren’t using social platforms to communicate about your new products, systems, awards, and happenings, then you’re missing an opportunity to think outside of the B2B box. Social media is where sales begin and end. Q: What do you envision as the next stage of social media (social media 3.0)? We think Social Media 3.0 is already here! People around the world make their living solely by creating content on their personal social media networks. YouTube, Vine, Periscope and Instagram make it completely possible to have a lucrative career in social media. Q: Any other thoughts or advice for aspiring social media mavens? Identify your goals and commit to a realistic plan. Consistency is so important to grow and retain a captive audience. Take a look at what posts perform best on what networks and incorporate that into your strategy as you grow. Have fun, take risks, and use emojis… just not too many at one time! We’re looking forward to talking more specifically about engaging social media communities at the upcoming IABC luncheon. Christina Edwards maintains relationships with some of the country’s most influential brands, organizations, and thought leaders. 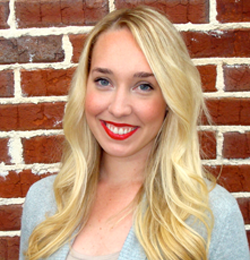 As one of Atlanta’s top social media strategists, Christina helps give her clients an edge by integrating social media platforms into multi-dimensional campaigns. With a strong belief in entrepreneurship, Christina excels at consulting business owners on increasing financial growth through creative strategies, team building, and branding development.